Testing your car battery regularly is crucial to having a reliable vehicle. By testing it frequently, you can make sure that there are no signs of weakness or corrosion ensuring the battery will not fail in the near future. The well-designed and efficient DY2015C is used by pros on both 12-volt and 24-volt lead-acid storage batteries. Its design makes it easy to operate and read with a large LCD display. It also features a printer that makes the tester’s operation more visible and convenient. Using a 4-wire Kelvin test connection, the DY2015C provides accurate circuit and strong digital processing. It also fortifies input protection inside the unit to stop incidences of polar reversal connection, poor test clamp contact, and over-high voltage input making testing safer and more convenient. This is a great option for vehicle repair, condition checks on lead-acid batteries, and battery sales. The ATD Tools 5489 tests batteries to 1000 CCA and includes a separate ammeter to allow precise loading of the battery. 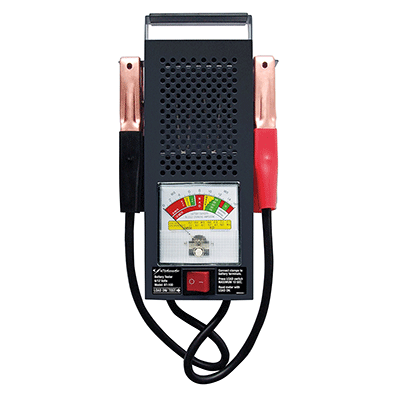 Ideal for 12-volt batteries, starters, and alternators, the ATD Tools 5489 has color-coded pass/fail bands that are temperature compensated on the voltmeter to give you precise assessments. The Quicklynks BA101 Battery Load Tester is a great option for 12-volt batteries and is a great addition for maintenance and repair shops. 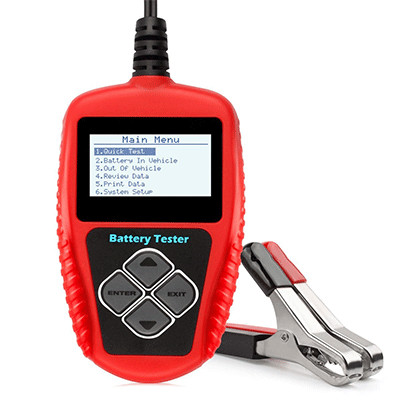 This tester allows you to detect a bad battery directly, so you don’t have to take the battery out the car. You can also print the testing data with a computer using a USB cable. The BA101 is also a multi-testing unit including a cranking test, charging test, and battery test. It also protects itself with a polarity reverse connection safeguard stopping a reverse connection from damaging the tester or affecting the battery and the vehicle. It also comes equipped with three feet of long cable made of thick flexible insulator making it safer than other battery analyzers. If you are looking for a smart and reliable battery tester, the AE300 battery tester was created to test 12-volt batteries and can quickly and reliably analyze and test your battery using Voltage, CCA Value, battery life, and inner resistance. With numerical results, you can check your battery’s condition to escape any surprise battery shutdowns. It is also compatible with a variety of batteries including GEL Cell, Marine Deep Cycle batteries, AGM, and Flood. With its safety features, the AE300 provides continuous testing of battery power making it a safe option for your battery. It also features reverse polarity and over voltage protection that makes it safer for both the equipment and the operator. Plus, it can fit in your pocket making it handy as well as useful. 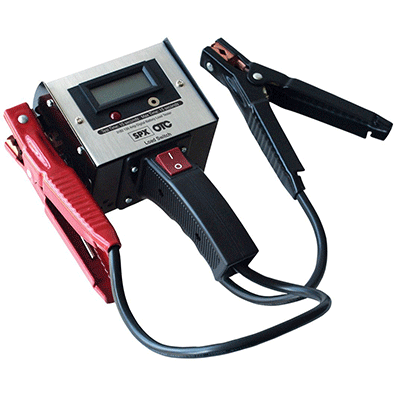 The OTC 3182 Battery Load Tester gives you precise results in a lightweight and compact design. This durable and rugged tester is great for everyday testing of both six and twelve-volt batteries. Featuring a large and easy-to-read display, the OTC 3182 also includes an alternator test lead, a side-clampere mount, a ripple detection light, a comfortable easy-to-grip ergonomic handle, an alternator ripple test, and a starter and charging system test. When you need a quick reading, the MOTOPOWER MP0514A Battery Tester features an LCD display with LED Indicator that gives you fast and accurate readings. It features a DC testing range for all types of 12-volt batteries and also offers safety protection for short circuiting, reverse polarity, and overload. The LED Indicators include colored lights that indicate the status of the battery, and the easy to read four-character digital display is lighted. The battery also includes 39 amp alligator clamps that have rubber paint housing. Developed to test 12-volt batteries, the BT100 Battery Analyzer works on AGM flat plate, flooded, and AGM spiral. This is a simple and inexpensive tester that gives you a quick response on your battery’s health in just three seconds. It has a wide testing range from 100 to 1100 cold cranking amps and can test multiple rating systems. 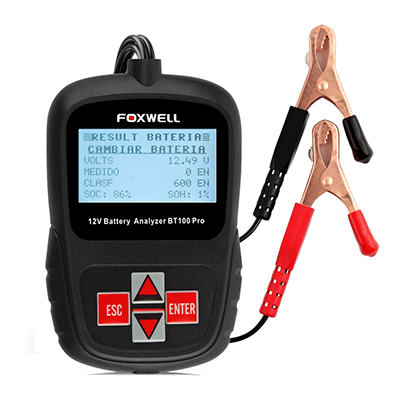 The Foxwell also can detect a bad cell and can precisely test both charged and discharged batteries. It also has a variety of safety features that include over-voltage protection and reverse polarity. 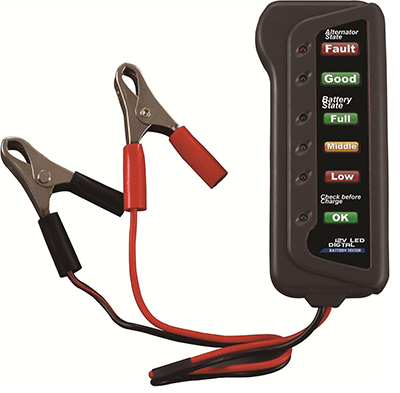 This pocket-sized tester is easy to use and convenient for any vehicle with a 12-volt battery. The Solar BA7 Battery tester works on batteries that range from seven to fifteen volts that are rated between 100-1200 CCA. It is convenient with a fast assessment that gives you both a pass/fail LED result as well as a numerical answer. The Solar BA7 also works with a wide variety of battery types that include AGM, maintenance-free, gel cell, conventional, and marine cranking deep cycle batteries. The Cartman Battery Tester works on 12-volt batteries and uses an LED display to indicate the battery’s condition. 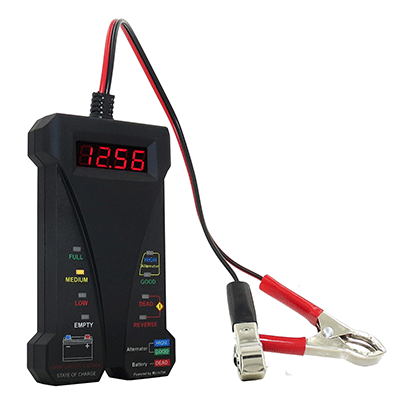 This is a sturdy and easy to use tester that can test a battery whether it is fully charged or not. The Cartman is a durable product that has an easy to read display. 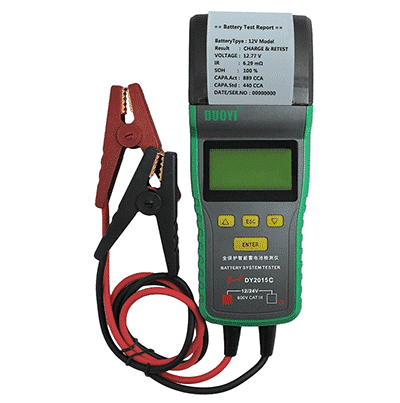 If you need a battery tester for everyday use, the Schumacher BT-100 Battery Load Tester works on both six and twelve-volt batteries. It offers a complete charging system diagnostic as well as tests the battery condition, load, and starter motor draw. 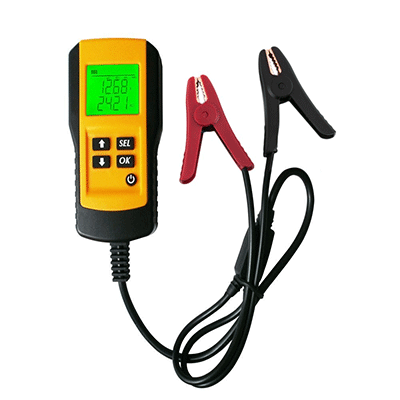 With its shock-resistant meter that is encased in sturdy steel, this durable tester can be used anywhere. It also features a strong baked enamel finish, a rubber insulated carry handle, a top-mounted rocker switch, and super-grip battery clamps.